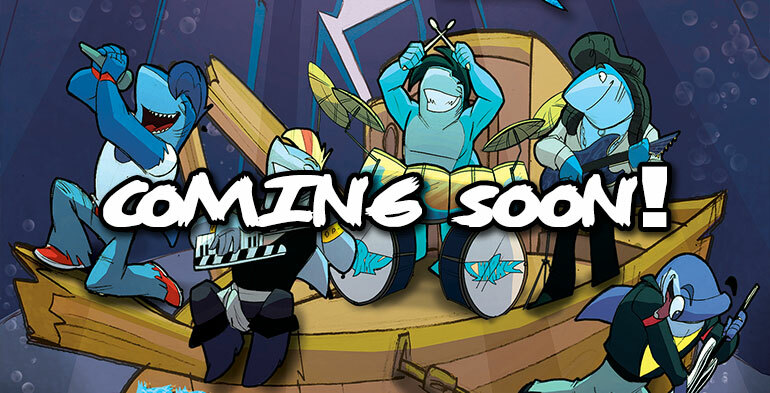 Sharky Sharky - The World's Greatest Rock Band For Kids! Sharky Sharky The World's Greatest Rock Band For Kids! Sharky Sharky are here to bring hope to a chaotic planet under siege from the forces of evil! Check out our first music video from our debut album Super Awesome Mega Rock - Bring the Rock! Frankenshark is a terrifying sea creature made out of lots of dead sharks put together. Despite the fact he is so terrifying we soon deiscovered he was actually a really nice guy and just wanted to be our friend! 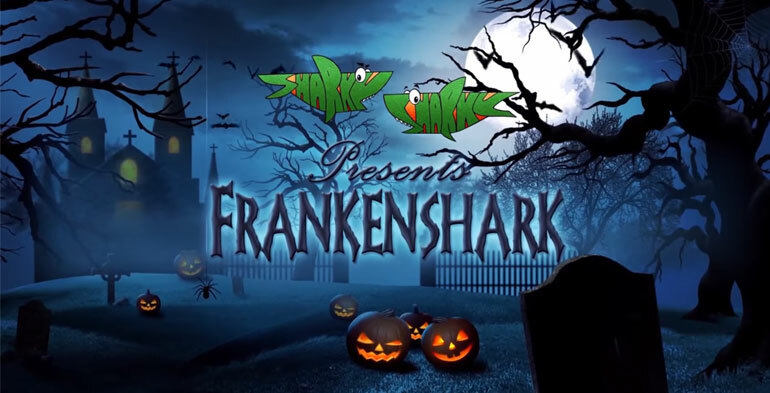 Check out the lyric video for our song Frankenshark here! Sharky Sharky like to have huge parties that all the sea are invited to! Regardless of whether you are a fish or a whale or a crab or big or small or blue or yellow or green we want everyone to come and party with us! Check out the official lyric video for Party Under The Sea, the first single from the Party Under The Sea EP! As Sharks we are always getting hungry! We like to just go into the kitchen and eat everything that is there! Pizzas the size of busses, Mountains made out of ice cream and Hamburgers as big as your house! Come on a journey with Sharky Sharky as we get stuck into the biggest feast the ocean has ever seen! On Sunny Days there is nothing us Sharkys like doing more than playing outside on our bikes, climbing trees and playing football, all with our friends! We make sure we're always home in time for tea though, we can't wait to see what our mum is making us! 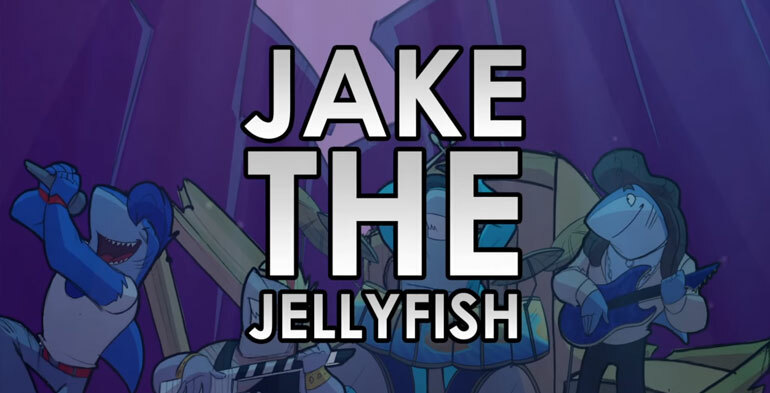 Jake the Jellyfish is a good friend of ours and he is a fish made out of jelly! Despite the fact he looks very tasty and we want to know if he is strawberry, blackcurrant or vanilla flavoured, we have come to realise that it is not okay to eat your friends. This song is dedicated to you Jake! 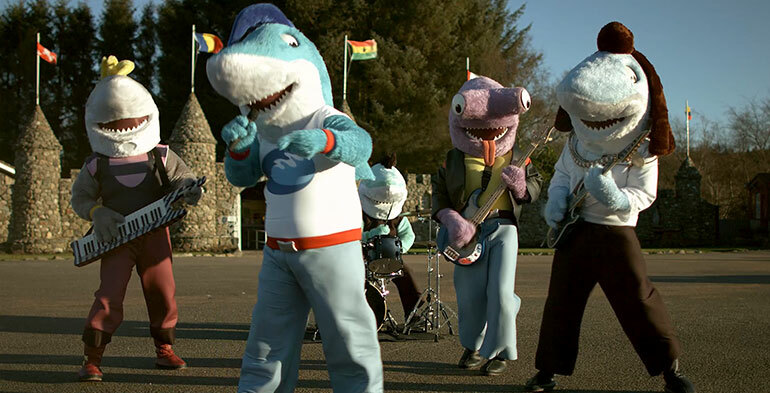 Sharky Sharky were made to perform live as a full 5 piece rock band! We love to perform live and can make your event an extra something special! Live performances also include meet and greets and photo opportunities with fans! 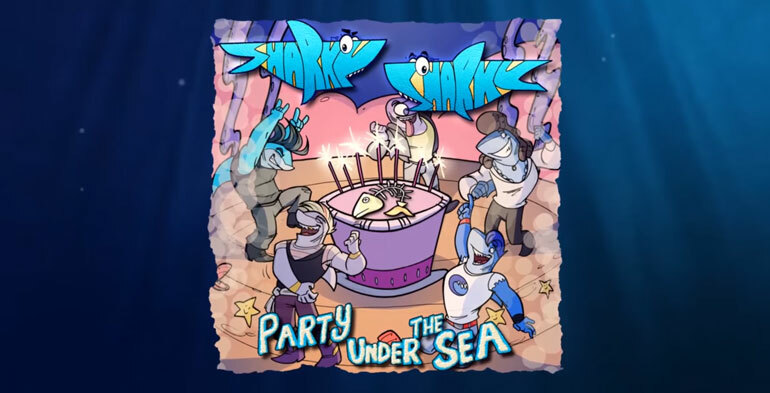 Sharky Sharky are available to perform at birthday parties! Parties include 2 hours of Sharky Sharky fun with a variety of different budget options! Contact us for more information. Members of Sharky Sharky can appear at your event in costumes to meet guests and have photos taken. Make your event an experience people will never forget! Come check out our online store where you can buy our CD's. We also have an increible amount of merchandise on the way including Sharky Sharky T Shirts, Cook Books, Music Instrument Instructional Books, Posters, Mouse Mats, Mugs, Hoodies, Stickers, Calendars and Birthday Cards! "...healthy, interesting listening for young folks without pressing any specific agenda on them – besides fun, of course! 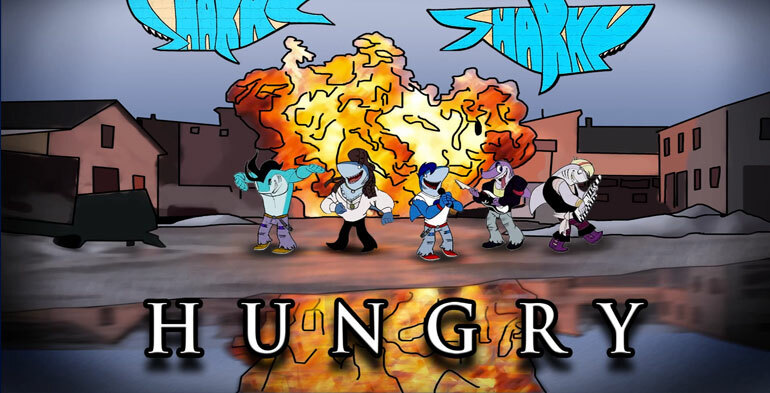 Sharky Sharky is well on the way to being another great band to get children into the world of metal, with the added bonus of being pleasant and contagious to adult ears as well." "Rocker-dads, rejoice, you might have finally found something that you can both listen when you take your toddler to school or the kindergarten. You can both shake your had and sing along with songs like 'Jake The Jellyfish' or 'When All The Lights Go Out', which is a pretty heavy rocker by the way. Even I, who's usually creeped-out by this happy-happy-joy-joy stuff, am smiling and head-dancing right now." In the year 2013 A.D. As a result of a curse by the evil octopus King Olof, our heroic sharks have been banished from the ocean and forced to walk the Earth indefinitely. They decided to form a Rock band in order to restore order to a chaotic planet under siege from the forces of evil, though, they would later discover that it was not in fact Emperor Olof who had cursed them, but a spell performed by the Arch-Wizard of Anchorberry for the forces of good. It was his belief that in a world where music had become irrelevant, boring and dull, there is but one hope for mankind. Sharky Sharky brings new hope to the Universe! Jawnofin is our keyboard player. He learned how to play piano back when he worked as pirate. He'd entertain himself for hours on the old piano in the ships hull and would impress fellow sailors with impressive jigs that would keep them dancing into the night! An established and famous member of the undersea aristocracy, Baxter was a personal bard to the Prince of Whales. Baxter is too posh to watch movies but his favourite play is Clamet by William Sharkspeare. Sharky is our singer! His favourite food is mackereloni and his favourite band is A Sea/D Sea! He enjoys surfing big waves and human surfers really respect his abilities as whenever they see him they always move out the way for him to enjoy the waves in peace. He loves food from the Mediterranean Sea - his favourite being Spaghetti Crabonara! He also loves the classic movie The Codfather starring Marlin Brando! Andy is the Sharky Sharky Bassist! Being a hammerhead shark he often gets confused for an alien! He loves Octopus Pizza (with extra tentacles) and his favourite movie is James Pond - Fishfinger starring Prawn Connery! © 2018 Sharky Sharky. All rights reserved.